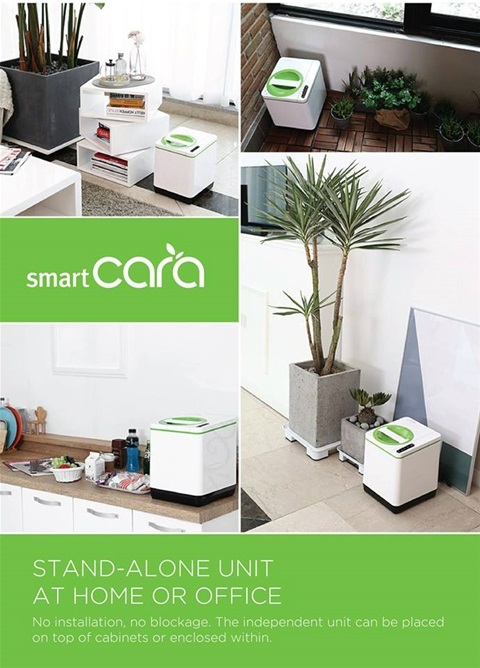 If you do not like the idea of waste food hanging about the house waiting for collection by the council and do not fancy hot composting or using a Bokashi system the Smart Cara might be the kitchen gadget for you. It grinds heats and dehydrates food waste reducing it in volume by up to ninety percent in three hours. The dry odour free material produced can be dug directly to the garden, be added to a conventional home-composting bin or to the normal council bin collection. The kitchen waste is put, or scraped from the plate, into a special bucket that is then placed in the machine. In three hours, the waste will heated, dehydrated and reduced by about 90% to produce a dry material that can be used as a soil enhancer. The Smart Cara is not cheap costing about £400 and about £4 a month to run but it does offer an alternative method of dealing with cooked food, meat and other food waste for those living in flats or houses without gardens or gardeners that only have a cold composting system who are not happy using a Bokashi bin. A longer version of this blog can be found on the Food Composting section.